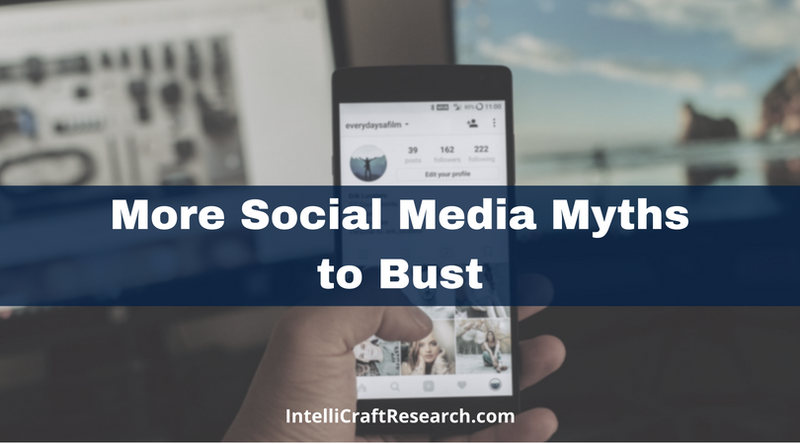 So Many Social Media Marketing Myths to Bust! Why do folks still believe these social myths? Many of these social media myths have been beaten down by experts much greater and more experienced than me – see the recommended reading list at the end. There are some companies and sites making it their mission to put real data to the test and SHOW that some of the rumors we hear are just myths. And some things … well …. we need to keep testing and keep a skeptical eye. That’s what we do as info pros right? We test, we evaluate, we sift and sort to find the best resources and solutions possible. 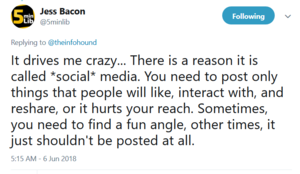 DON’T: Tweets that run too long and trail off into “….” at the end, because that was a post you write for Facebook, just shows you aren’t paying attention, or you’re running purely on automation. Instagram posts shared automatically to Twitter … but that only have a link and no photo. DO: Keep it short and make ‘em curious to click on Twitter; give a little more context or a story on Facebook; use hashtags that fit the platform (more on that later); and make sure your pics show up correctly. Use a tool like Canva or Adobe Spark and make sure your images are the right size for each platform. Nope, not really. Counts are mostly a vanity metric. Likes and follower counts don’t automatically equal success. Yes, awareness still matters. Yes, you do need followers/fans or what you post isn’t getting seen at all. Engagement matters more – to the social channels, and to your bottom line. Marketing these days is much more (if not only) about sharing content that’s valuable, helpful, educational, and sometimes entertaining – quality over quantity. It’s more important – for a social account that works, as well as overall marketing – to have fans/followers/advocates who are actually interested in what you’re saying, interact with you, than a huge number who don’t care as much, aren’t invested, or may even be bots. Or at the very least aren’t part of your community or ideal audience group. So which metrics DO matter? Other metrics that matter: Audience Growth Rate, Post Reach, Potential Reach, Impressions, Average Completion Percent (or time watched on videos), Average Engagement Rate, Mentions, Social or Brand Sentiment, Conversion Rate, Click-thru-Rate, Bounce Rate, etc. Buffer gives 19 social metrics to track; SproutSocial breaks out the metrics that matter for each social platform; Mention gives 10 metrics to pay attention to (including, naturally, ones it helps with – like sentiment); and Social Media Examiner helps you know how to choose and track what matters. And that last point is a really good one – you could measure dozens upon dozens of metrics. But do they matter to YOU? What information do you and your team (even if the team is just you) need to know in order to a) do your job, b) update your plans, and c) know if you’re meeting your marketing goals. If a metric doesn’t tie back to a goal or show you progress towards a SMART marketing goal, then than metric doesn’t matter to you right now. 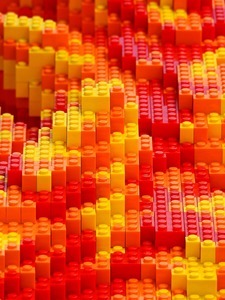 Track what makes you smarter about YOUR org’s social media and marketing performance. And be ready to change and measure something else later. C’mon, you KNOW this isn’t true! Social media, like any other marketing or communications activity, costs you time – a lot of time. And your time is NOT free! 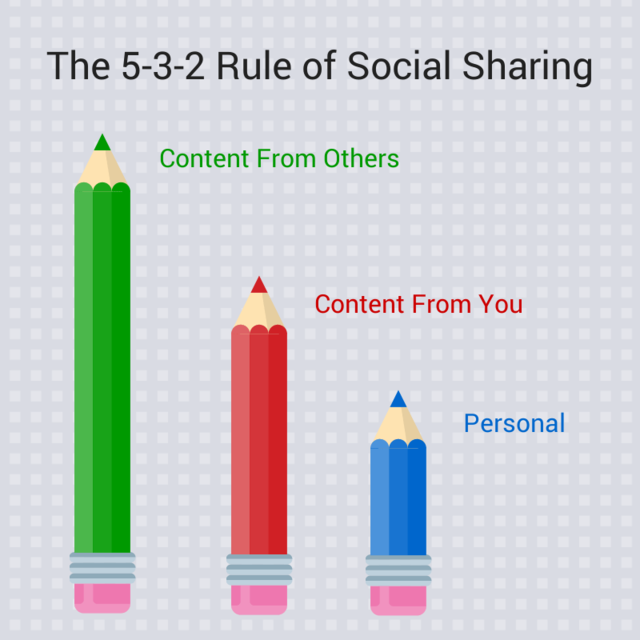 Doing social ‘right’ also takes resources, tools, and finding and creating content. Some of those tools for scheduling and tracking metrics cost money (there will come a time you can’t get by on just the free versions of HootSuite or Buffer or Canva). And let’s face it, more often these days you need to buy ads, promote/boost posts, and spend in order to ensure a message is seen by the right target at the right time. There’s no such thing as 100% free marketing, don’t listen to anyone who says otherwise. 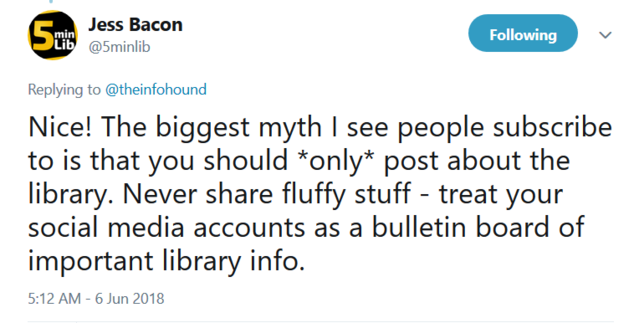 I asked pals to tell me Social Media myths – thanks Anne! Ugh. No. This may be the biggest mistake I see my library and nonprofit pals buying in to and spinning their wheels on. Heck, I see larger brands make this mistake too – treating social media like it’s a bullhorn and shouting out messages AT people. Tough love time – if this is you, stop. Right now. Blasting out nonstop promotions is a sure fire way to get muted, unliked, unfollowed, or ignored. Remember why most people are on social media (hint: it’s not to listen/read/watch ‘ads’). Don’t forget the SOCIAL part, which means listening, sharing, and having two-way conversations. Too many brand social accounts talk just about themselves, their products, their services, in a 1-way stream. Also, social media is NOT an extension of your passive bulletin board. A good social plan that leads to engagement is not about just posting the Facebook equivalent of the flyers you post on columns, walls, or boards in your location. Good, strategic social media needs a mix of content – original, curated, promotional – and the promo bit is a really small part of the mix. General guidelines on mix for social content keep the self-promotional items to <20%, maybe only 10% of all your posts. 30-60-10 (‘Golden Ratio’), 5-3-2 or also 80/20 other/promotional content is a common ratio. 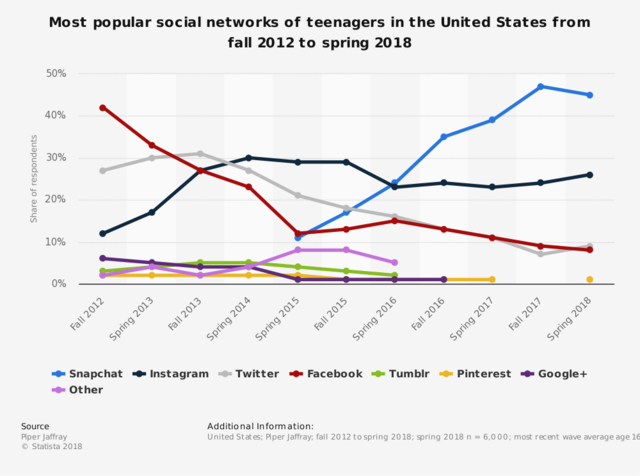 If you’re still on the fence, especially about newer platforms like SnapChat – just because teens are their and teens are a big part of the audience you’re trying to reach, doesn’t mean it’s worth it to spend significant time trying to make it work. For any new platform – you should likely grab your library’s name or handle, but you might want to wait to put time and resources in until there’s more users and more data. You need to be able to see a return on your efforts. If you add SnapChat, get very focused and strategic and follow advice for local marketing, creating filters for events, and maximizing use in your location. Buffer did a side-by-side comparison on if a business should use Instagram or Snapchat for marketing – and like much else, the answer is “it depends.” Even the social experts like SME (Social Media Examiner) have noted that Snapchat is low on the list of marketing channels, and experienced marketers aren’t really incorporating it. Uh, I don’t think I’m young. 😁 You probably aren’t either, or not what was meant when someone said “only young people”. While it started for college kids and then teens, we know everyone, including our parents and grandparents are now on Facebook. It’s often the ‘entry’ social platform, thanks to ease of use and its ubiquity. It has become more popular with Boomers, 41% of those 65-74 now have FB accounts. But Instagram is the fastest growing and has 1 BILLION monthly active users as of June 2018. You can’t afford to ignore IG! 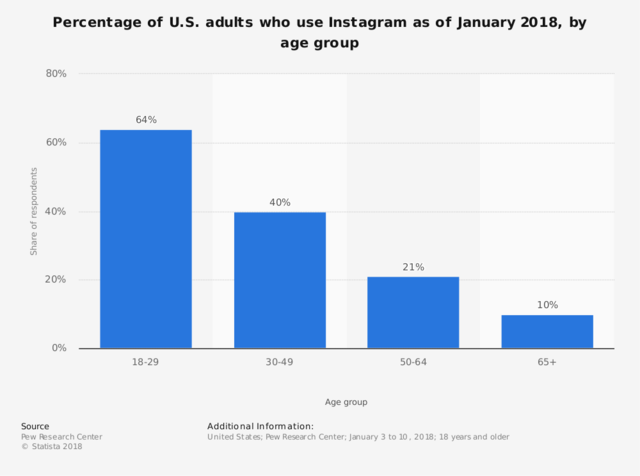 Yes, SnapChat is the preferred platform among teens, with Instagram 2nd – however its overall user size is MUCH smaller than IG and it’s not as favorable for marketing messages. Adjust your goals and expectations; maybe SC is just for joking and entertaining your users; and IG is for branding, events, behind the scenes and more true marketing messages. Using the wrong tags, or generic tags, or too many tags, can kill your social efforts – and make you look like you are trying too hard, are spammy, or just clueless. There’s research (Buddymedia) that says using more than 2 #hashtags on Twitter leads to 17% drop in engagement, tweets with only 1 or 2 #tags have 21% MORE engagement than tweets with 3+ tags. Learn to use your hashtags wisely. Really? Your boss/supervisor/director/dean thinks you’re the only library who has the sliver of the U.S. population that is NOT on some social platform? 😆 C’mon! Your users and community members ARE on social [As of Jan. 2018, 69% of all U.S. adults are on at least 1 social platform – Pew Research Center] and they do expect to find you on the biggest platforms where THEY each turn to daily. You do NOT necessarily need to be everywhere – you SHOULD be where your users are most likely to be talking about you, your services, asking questions, complaining, raving, searching. Know where you should be listening, and answering those questions. Where do they expect you to be? Then at least have a minimal presence there and INTERACT! Answer those questions, engage with comments. BUT … save your real strategic strength and work for the platforms that will work hardest for YOU. And they won’t be the same for public libraries vs. small college libraries vs. large state universities; and not the same for reaching teens vs. moms with young kids vs. small business start-ups. Look at the data, look at your staffing and resources, and pick your battles. And we know that just because someone is young, and practically came out of pre-K with a smartphone attached to them, it doesn’t make them 100% tech savvy and definitely not marketing savvy. 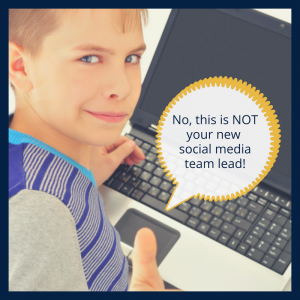 Teens or interns don’t necessarily know and get your marketing strategy. Success at social media means supporting your overall marketing goals and strategy, not just using the latest memes, hip talk, or emoji things to death. Going too cheap on help or letting volunteers run your social accounts means they may not understand your customer service policies and ethos, they aren’t invested, they aren’t prepped to handle PR issues, and they don’t have the same community relationships. Can you TRAIN some interns, teens, or volunteers? Yes, you probably can. But know it takes time and you need a well documented marketing strategy, marketing plans (including your social strategy and content), style guide, checklists, a workflow or approval process. Clearly define roles, and goals. It’s doable, if you set it up right from the beginning. Maybe you let interns, students, or volunteers do content audits, check your analytics and make reports, add curated content to your content calendar, find appropriate graphics or create them for you. Some colleges and universities have had success with students doing a 1 week take-over of the key social accounts each term. Sure, in a way that’s true. After all, why post ‘bad stuff’? But… can you define what is the ‘good stuff’? Are you sure your stuff is really that good for your audience? And there’s still the problem that if they don’t ever see it, they can’t engage with it. The ‘Field of Dreams’ mentality doesn’t work for SM any more than any other marketing tactics – you can’t just throw it out there and expect results like magic. Is your message interesting? Does it matter to your audience? Is your message simple and concise? Did you remember your singularly focused CTA? Is the content truly exciting or kinda boring? Figure out YOUR mix of ‘good stuff’ – what gets your fans, followers, enthusiastic and loyal audience, to talk, comment, and share? Do more of that. Exactly! Don’t be boring. Be social! NO! It needs to be integrated into the rest of your marketing. And that includes whomever is running or managing your org’s social accounts. They MUST be tuned in to your whole marketing plan and strategy. Sure social media has its own best practices, tweaks, techniques and tools – but SMM (social media marketing) is still about matching goals, telling stories, being engaging and helpful, and getting actions. AND you absolutely can NOT build a marketing plan or your whole online presence solely on SM. I love a quote from Jay Baer, “content is fire. Social media is gasoline.” Social can drive traffic, create more awareness of other content, amplify your other marketing and PR efforts. A good social media strategy works hand in hand with your other marketing and communications plans and strategy. Social media won’t 100% replace all other forms of marketing. It absolutely can NOT be your only home online, it doesn’t replace your website. I’ve seen so many small business, solopreneurs, small nonprofits burned badly because they put all their marketing eggs in the Facebook Page basket. 😢 You still need to get found in search results. You need video. You still need email. You may need outdoor and old-fashioned direct mail. You definitely need to think about community relations and PR, and you probably need to add paid online ads to your budget too. I’m not saying go wild, write in text-speak, leave in typos, or ignore all grammar or good writing skills. Spelling does still matter. Don’t mix up “your” and “You’re” or “their, they’re, there” because that stuff matters! But it’s ok to use 10 instead of ten; sentence fragments are ok; you can leave out some prepositions, and don’t worry so much on punctuation. Don’t insult anyone or use awful terms – but good grief, don’t be stuffy and boring either. Loosen up a little! Some of the best brands on social media do NOT shy away from showing personality, having fun, even poking fun at themselves (I mean, have you seen Merriam-Webster and its polite trolling?! or Wendy’s, Casper, or Burger King). Brands that write in careful, precise, bland, corporate speak get ignored. Or worse. Social media is not a peer-reviewed journal or the New York Times. Write like you speak. Social is conversational. Have a personality that’s congruent with your brand (you have a brand style guide right? With tone and voice?) Connect personally! Be HUMAN! Well, it won’t lead to results if you don’t do it well, or if you don’t ASK for the action. Social needs goals, a strategy and a plan. Just like any other piece of marketing. It needs to connect to your larger marketing goals. Use social media to drive traffic back home (your website), to connect and listen to customers, to connect with influencers in your niche or community, to be part of larger conversations, and to give customer service. 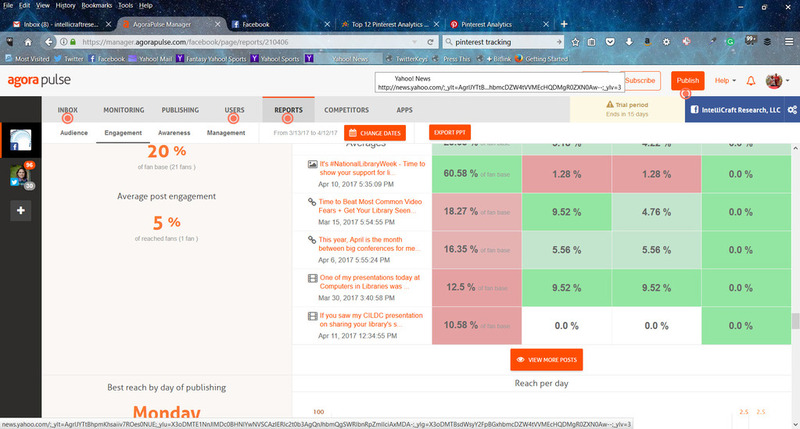 Go back to your SMART marketing goals, check the section on metrics up above so you know what you’re going to be measuring, plan your social content, and ask your audience to DO something. Track it. Tweak it. Try again. IF you set your marketing goals, AND your social plans align, you CAN measure results. Jay Baer, of Convince and Convert and working for the CMI, “social is extremely measurable, but first you have to do something that can be measured.” – Well, that’s true for ALL marketing! Jay did write a big chapter in one of his books all on social media metrics and ROI (in The NOW Revolution). You do have to know what social activities lead to desired actions in order to set up measuring, or know what to measure. Define your goals and you can define your social ROI terms. Businesses want to know which social activities lead someone to make a purchase. Nonprofits want to know what leads to a donation. You want to know if a social post led to a signup for a new card. We may want to know what leads to signing up for one of our events, to subscribing to a newsletter, or landing on a page where they enter their library card number and use an online resource. The better we understand what we want folks to do after seeing our social media messages, the better we can measure and figure out ROI. It IS possible to tie in ROI and social and there are plenty of tools for social metrics that aim to help you do just that (e.g. AgoraPulse, SproutSocial, SocialBakers, etc). There are probably dozens more social media marketing myths out there – feel free to send them to me. But hopefully by reading some of these resources, seeing the stats, and putting on our critical thinking caps, we can see that social media isn’t all that special or mysterious. We CAN make it work for our organizations and temper our expectations a bit. Get more Twitter tips from Sprout Social. Some of these social media ‘rules’ that Buffer has researched and written about (back in 2015) still apply and others we’ve busted to added new info to guide ourselves.